I hadn't posted to the forum in a long while, but recently I painted a couple figures that fit the "undead" bill (a skullfaced necromancer type sorceror does that, right? ), so time to post them here. Both of them represent Skeletor, the most evil looking badass villain in the history of Saturday morning cartoons and 80s boys' toys, superbly rendered in 30mm by the talented hands of Boris Woloszyn for Quest Miniatures. To say I'm in love is an understatement. Painting this figure (or figures) was the single most enjoyable painting experience I had to date and possibly the best paintjob I have delivered so far and I thought I was passed my prime. I had to do two versions, one built out of the box and one converted to have his sword as per the toy version. Both figures were glued to their plastic bases and then I sculpted some tile texture over it with putty. As he is based on the Filmation cartoon version, I went with a bright colour scheme to match that, which was not a natural thing for me to do as I have a tendancy to go for muted colours even when I'm not trying to do so. I'm very happy with the end result, but I'll let you make up your own mind. Both Skeletors, side by side. The first is the original sculpt built as is. I do like the pose with the staff, it's quite dynamic I feel. As I said, I went with a bright Filmation colour scheme and I'm particularly pleased with Skeletor's yellowish face and his blue skin. For the base, I went with a more understated purple so it wouldn't look too much like his clothes are made of the same material as the flagstone tiles. I will keep this theme for the other Evil Warriors. The second version is a bit of a mix of Filmation and toy references. In the cartoon, when Skeletor had a sword, it was a regular one, where in the toy version, he had his half of the powersword that looked like a purple version of He-Man's and that's what I went for here. The sword was left over after my conversion of the spare He-Man figure to hold his axe, so that was just drilled and pinned into place. The swordhand is another plastic bit from the aforementioned Fireforge men-at-arms set. I cut away the left hand from the staff, filed it down and glued it into his open right hand. Easy. "It's over, He-Man. I have the high ground!" Not sure either, but he certainly fits in with an undead army as a necromancer if nothing else. Something a bit different, I've been building a collection of 60-65mm Victorian horror miniatures for skirmish gaming and some of them are, of course, undead. Count Orlok is a vampire from Transylvania, and is known as "The Bird of Death", who feasts upon the blood of living humans. He is believed to have been created by Belial, the lieutenant demon of Satan. Like Count Dracula, he traveled to London by ship. His journey by sea spread plague all over Europe. Although an elder himself, Orlok reluctantly serves Dracula as one of his close advisors. Doing so, he takes some pleasure from the fact that his appearance fills the Count with distaste. Orlok is, of course the vampire from the cult movie "Nosferatu", who does serve Dracula in Kim Newman's Anno Dracula novels. The figure is a metal kit from Miniaturas Beneito. While technically listed as 54mm, the figure is of a similar size to the 65mm King and Country figures and fits in beautifully. Only thing I changed was the base, everything else is built and painted straight out of the box. By order of her Majesty, the Queen, your reign of terror ends here, soulless fiend! He turned out really well! All that grey fits him well, both Victorian and spooky. He looks also as if ripped straight out of a black&white movie, which is yet another plus! Thanks! My aim was to use some colour, but still keep the black and white movie feel for him. I did a few more undead figures for this project. It is said Dracula's power extends to controling the creatures of the night. Large vampire bats have been spot in the city and unlike normal bat behaviour, they have been attacking humans without fear or hesitation. There are some who whisper these aren't true bats at all, but lesser vampires who have learned to transform into giant bats, though such claims have not been verified so far. One thing is for certain, alive or undead, they are ferocious creatures best avoided. The original models are retired 28mm giant bats made by Masquerade Miniatures, probably as Warhammer proxies. Being as big as humans in 28mm means they are still a respectable child-sized monstrosity in 60mm and the added wingspan makes them a terrifying sight indeed. I had to sightly convert them to remove some off-scale details and then rebase them to match my other figures. I added a repainted Lemax fire hydrant as a support for one of them, which also helped to raise him at eye-height for the 60mm humans. Attacking bat, with fire hydrant. I love the He-Man and Skeletor diorama. I had no idea that someone had sculpted miniatures for Skeletor and He-Man. I will have to look into this further. Interestingly, when they updated Master of the Universe with new toys and a new cartoon series in 2002/2003, Skeletor's sword was able to split into two and was not dirived from the power sword. Also interestingly, none of the cartoon versions ever went with the split sword from the toy storyline, and that includes the classic Filmation cartoon, where Skeletor didn't even have a sword most of the time. Great stuff, White Knight! Love the diorama, the vamp and those incredible bats! Spooky! Thanks! I have a couple more of the large scale vamps! Count Vlad Dracula moved from Transylvania to England so that he may find new blood and spread the undead curse. He boarded a Russian ship, the Demeter, taking along with him boxes of Transylvanian soil, which he required in order to regain his strength. In England, Dracula successfully purchased multiple estates under the alias 'Count De Ville' throughout London and devised to distribute the 50 boxes to each of them to secure for himself "lairs". Despite attempts to stop him by Abraham Van Helsing, Jonathan Harker, Dr. John Seward, Quincey Morris, and Arthur Holmwood, Dracula first takes Lucy Westenra, who is subsequently killed, and Mina Harker, the latter being turned, but managing to escape his control and remaining mistress of her own destiny. The count is an extensive conversion of a cheap Lemax Christmas figure. I added the shades, hair and beard, made a new cane and bulked out the legs and arms so he wouldn't look too weedy. What did you expect, a black evening suit with a cape? It wasn't easy to get the "eyes peeking over the top of the shades" look, but I think it worked. I would have prefered to do red shades, but decided to stay true to the source material which had them dark blue. Is that what they call "bedroom eyes"? I'm a handsome foreigner in a stylish suit, why won't they love me? The base figure was one half of the Lemax model called "Attending services"
Bloody hell you are amazing! Your conversion work is second to none! I doubt I could ever have the patience to create what you have! Kudos for a job well done! Wow, the models look great! Very realistic. The figure is a slightly converted Lemax figure from their Halloween range. The original model is supposed to be a young lady enthralled by a vampire. She had her eyes closed, so I resculpted them to be open and added some wear and tear (bitewound on her arm where it was miscast due to an airbubble and a tear in her dress). She was then repainted to match the other figures and her dress was dirtied at the hem, with random smears of dried blood. "In the name of the Queen, you shall not pass!" Wilhelmina "Mina" Harker was the wife of Jonathan Harker. 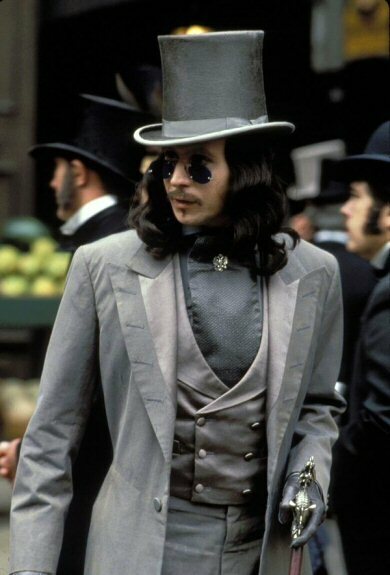 After the death of her friend Lucy Westenra, she joined the coalition around Abraham Van Helsing, bent on destroying Count Dracula, the vampire. Unfortunately, the Count learned of this plot against him and took revenge by visiting — and biting — Mina at least three times and feeding her his blood, dooming her to become a vampire should she die. Eventually, Mina was turned and became a vampire, but unlike many, she managed to hold on to part of her humanity and in her new found form, she is a valuable asset to the League of Extraordinary Gentlemen. My version of Mina is based on the LXG movie interpretation (rather than the graphic novel, where she never became a vampire). The figure is a Lemax christmas figure, representing a young lady carrying an umbrella. I sculpted on a scarf and painted her in pale skintones and black and red clothing. I gave her red pupils to suggest the bloodlust in her eyes and to mark her more clearly one of the undead. The umbrella adds to the suggestion of a vampire shying away from the sun, I think. All in all, a pretty easy, but effective conversion of a cheap figure. I'm quite happy with the way she turned out, though she looks much better in person than in the pictures. I know it's not raining, I just don't want the sun to ruin this lovely complexion. A comparison with the original figure. I quickly realised she'd make a fine vampire lady, which, after a while, mutated in the idea of using her for vampire Mina. These christmas figures don't always show it, due to seemingly being painted by a drunk person, but many are quite lovely sculpts if you look more closely. The difference a decent makeover can make. Madam, you have the most remarkable eyes. Thanks, I agree she looks a lot better than she started out. Thanks for the link. There's some great work on those He-Man miniatures there. Indeed. He relied on his havoc staff most of the time. He makes much greater use of his sword in the 2002/3 cartoon series, although he still favours the havoc staff. Thanks! I was quite happy with the way she came out. Wow! Those look great. The faces are very expressive. Well done. Unbelievable work! Inspector Holmes looks outstanding! I am not worthy of this thread!